Erhöhtes Fleisch und Blut (Exalted flesh and blood), BWV 173, is a church cantata by Johann Sebastian Bach. He composed it in Leipzig for Pentecost Monday and first performed it on 29 May 1724. Bach probably wrote the cantata in his first year in Leipzig for Pentecost Monday. He based it on a congratulatory cantata Durchlauchtster Leopold, BWV 173a, composed in Köthen. The music of the 1724 version is lost, but a version of 1727 is extant. Possibly the 1724 version was even closer to the secular work than the existing version. The unknown poet wrote parodies for six of the eight movements of the congratulatory cantata, including two recitatives in movements 1 and 5. Bach did not use movements 6 and 7 in this church cantata, but 7 later in Er rufet seinen Schafen mit Namen, BWV 175. The prescribed readings for the feast day were from the Acts of the Apostles, the sermon of Peter for Cornelius (Acts 10:42--48), and from the Gospel of John, "God so loved the world" from the meeting of Jesus and Nicodemus (John 3:16--21). The poetry is a general praise of God's great goodness towards men. Only movements 1 and 4 relate to the Gospel; the first stanza of movement 4 is a close paraphrase of the beginning of the gospel text, "Also hat Gott die Welt geliebt ..." (For God so loved the world, that he gave his only begotten Son, that whosoever believeth in him should not perish, but have everlasting life.) This verse became the opening chorus of Also hat Gott die Welt geliebt, BWV 68, for the same occasion a year later. 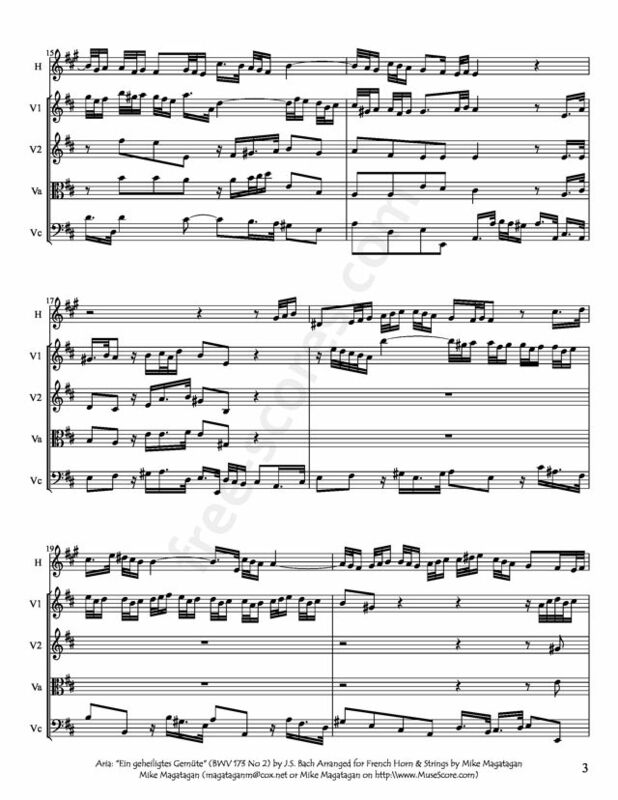 Bach gave the first movement to the tenor instead of the soprano in the secular work and changed the vocal line considerably, but wrote these changes into the original part. Movement 4, a paraphrase of the quotation from the gospel, is a duet, which handles three stanzas in ever richer variations: the first stanza is for bass and strings in G major, the second in higher D major for soprano and additional flutes, the final one for both voices in A major and with more figuration. The structure of this duet is unique in Bach's cantatas, the variations in rising keys, and the increase in instruments and musical texture all add to illustrate the exaltation mentioned in the title of the cantata. For the Baroque, the exaltation of the noble employer of the secular cantata could be adapted without change to the exaltation of God. 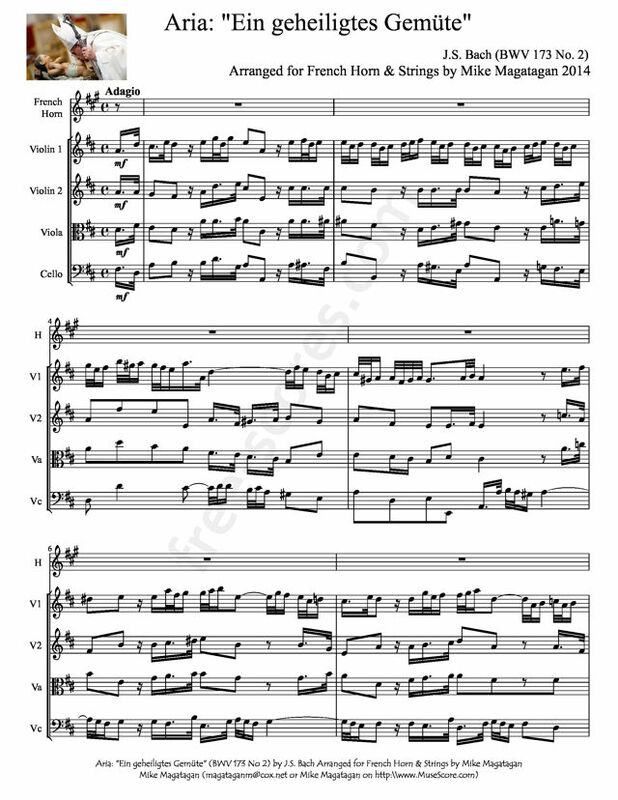 The final chorus, based on a duet as movement 8 of BWV 173a, is partly expanded to four parts, but in homophony. 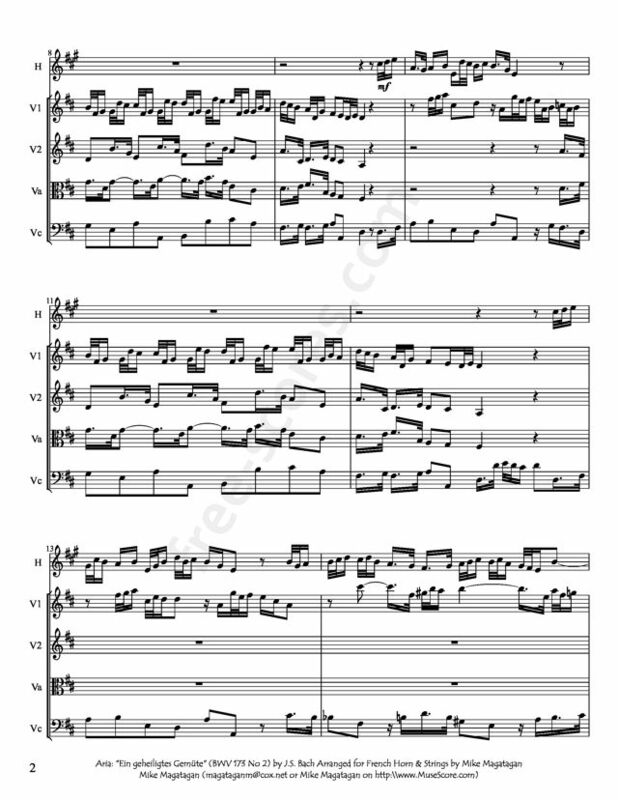 Although this cantata was scored for four vocal soloists (soprano, alto, tenor and bass), a four-part choir, two flauto traverso, two violins, viola and basso continuo, I created this arrangement for French Horn & Strings (2 Violins, Viola & Cello).